I was reflecting recently on how my dad could hammer a big nail in about three strokes. He was amazingly handy. I think I am pretty handy, but I am about 25 on a scale compared to his 100. I realized early on that I was not good with hammers and nails. So I use screws instead. They are easier to reverse and also stay in longer. But it’s much slower to do screws than nails – if you’re good with nails. Point of this story? If the normal way doesn’t work for you, find another. Do that and be satisfied. 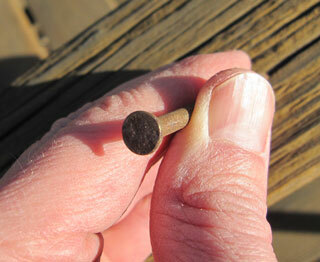 I rarely use nails for framing; screws are much easier to reverse if I mess up. When I do use nails, I usually use my compressor and nailguns because it’s much faster and the outcome is easier to clean up. But hammering nails can be very satisfying. Hammering nails can be satisfying – if you hit the nails! My equivalent is chopping wood – but since we don’t have a fireplace, that is a rare activity. Individuality is important. Choice is good. I like to do things my way – which is usually the screw. If someone can show me that the nail is a better course of action there I go but I reserve the right to use the screw if I so choose.